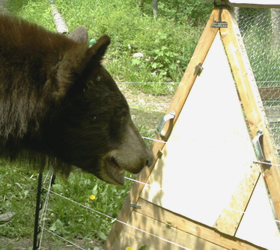 The availability of bear attractants increases conflicts between people and bears. 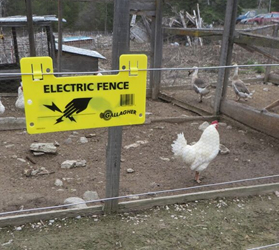 Attractants, or anthropogenic foods, are items such as garbage, bird feeders, domestic fruit trees, chickens and livestock. Bears are omnivorous, have an excellent sense of smell, and must gain enough weight during the season to sustain them for 4-7 months of winter. 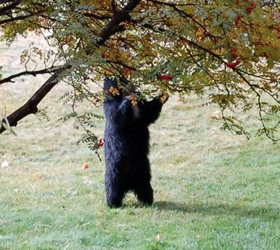 All too often bears find anthropogenic foods while in their quest for natural food resources. 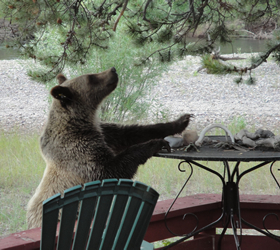 Bears that become used to being around people may be called “habituated”. 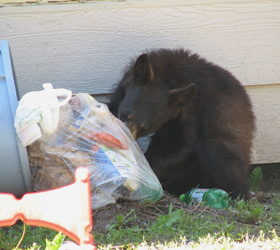 Bears that receive “food rewards” like garbage or birdseed can become “food-conditioned” and exhibit behaviors like walking on porches and causing property damage that leads to their removal. 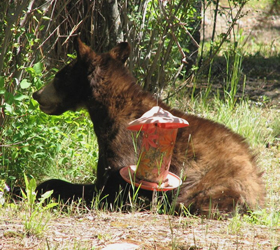 By securing attractants on your property you can keep bears wild, improving the safety of both bears and people. 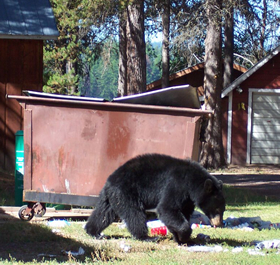 The Interagency Grizzly Bear Committee (IGBC) keeps a list of certified bear-resistant products such as: coolers, backpacking containers, panniers and garbage containers. Click here for an updated list. Click on the photos below to find more information on specific attractants and how to manage them!